Alaska was rescued from a local high kill shelter. His previous owner was contacted but they did not want him to come back to their house. 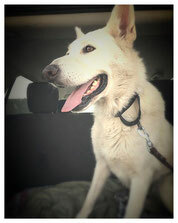 He is currently at his foster home, doing very well and gained some weight. He is great with other dogs and cats. About 70lbs, 4-5 years old, neutered male. Snowball is only 4 months old. She is spayed, received all UTD shots and microchipped. She is very friendly and great with other animals. 6.8lbs. We believe she is still growing and stays in a small size. Sadie's previous owner has been hospitalized and she needs her new home. She is appx 2 years old, 10 lbs, black color terrier mix. 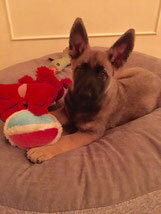 She knows several commands, crate trained and finished a puppy classes with a trainer. She is well behaved and friendly. 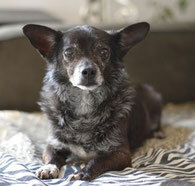 Chi Chi is a neutered male, 8 years old, 10 lbs and super sweet. He is house broken and VERY MELLOW. He can be playful if he wants to.. but he is mostly quiet and we have not heard him barking yet. He gets along very well with other dogs (even though he does not really play with them) and good with a cat as well. A very sweet boy who needs his forever home. She has received the first puppy shot and microchipped. 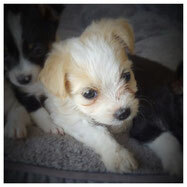 Currently as 8 weeks old, he is 2.5 lbs and we believe she will stay in small size about 10-15 lbs when she is fully grown. He has received the first puppy shot and microchipped. 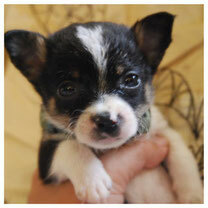 Currently as 8 weeks old, he is 2.5 lbs and we believe he will stay in small size about 10-15 lbs when he is fully grown. Currently as 8 weeks old, she is 2.5 lbs and we believe she will stay in small size about 10-15 lbs when she is fully grown. 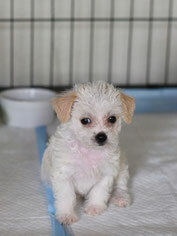 Currently as 8 weeks old, he is 2.1 lbs and we believe he will stay in small size about 10-15 lbs when he is fully grown. 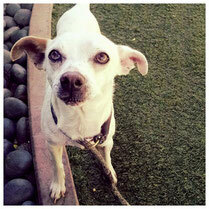 Mile was just rescued from a local shelter and waiting for his surgery to remove polyps. More information is coming soon after his surgery and he is ready for the adoption. Milo is 8 years old. Shis Tzu. Black and white color. 16 lbs. 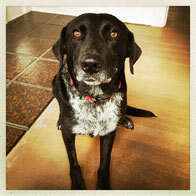 Ellie just joined DOGzHAUS and her information and picture will come soon! 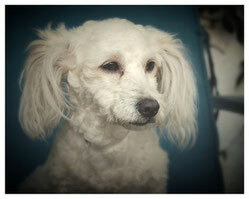 She is 2.5-3 years old Poodle/Maltese/Doxie mix. She is about 12 lbs. 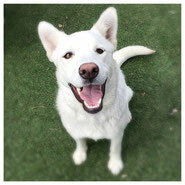 She has a mellow personality and is good with other dogs and small children. She is spayed, microchipped and received UTD shots. Radar was rescued from a local shelter and the shelter thought he was about 2 years old but we think he may be a little younger. He is very mellow and very sweet. He is housebroken. He loves to be around people but does well with other dogs as well. We do not know how he does with a cat. Maybe he is okay with a cat. He is good with small children. He has a mellow personality and is mostly relaxed next to his favorite person. About 9-10 lbs. Received UTD shots, micorchipped and neutered. She was abandoned in the empty house after her previous owner moved. We got a call and safely rescued her. She is great with other dogs and good with cats. She is great with children. 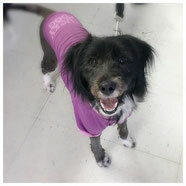 She loves to play fetch but does not play with other dogs so she will be totally okay as an only dog in household. She is quiet and rarely bark. She has her old injury on her right front leg which sometimes make her tired. We checked her condition by x-ray. She has no broken bone or fracture. It's an old injury and her right front leg looks skinnier than the left one, but she is fine and NOT in pain. Piper is about 15 lbs and adult. She is already spayed, received UTD shots and microchipped. She was very scared in the shelter and we were told "she would bite" but we knew she was terrified in the scary shelter. Once we rescued, she has never shown any aggression. She is actually VERY sweet and friendly. Great with other dogs. 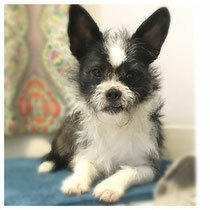 She is terrier mix. Black and white color. 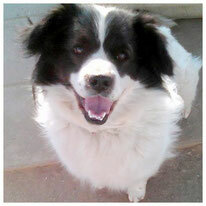 Ziggy is about 20 pounds, 5 years old, neutered male and super sweet. When Animal Control caught him on the street, he was actually staying with his dog friend who was hit by a car. Sadly, his best friend had a bad injury and passed. We could not ignore him and rescued from the local high kill shelter. He is great with people and other dogs. He is always happy, always positive. He loves to be around people including small children and play with other dogs as well. He is good with cats too. Little Buddy was wandering in a field near a Native American Reservation area in Palm Springs and rescued by our volunteer. He is appx 2 -3 years old. Black and White color Border Collie mix. He is about 35 lbs and fully grown. He has been neutered, received UTD shots and microchipped. He is currently living with other dogs at his foster home but may be happier as an only dog in the household because he loves to get attention. Hi!! 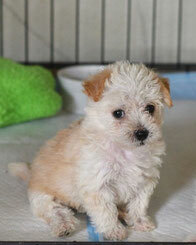 My name is Jolie but my foster mom calls me Monkey because I play non stop. 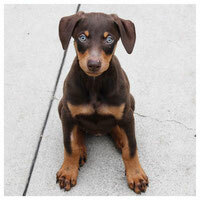 I’m 9 weeks old Doberman and about 10 lbs at this point. I am a little smaller than an average size but I have been having high protein puppy food (Wellness Core Puppy and chicken) and my foster mom said I was already bigger than last week! 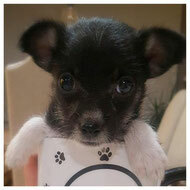 I received a set of puppy vaccination shots but am too young to have a rabies shot. I am also microchipped. I was spayed last week. My foster mom said my incision was healing nicely and I was doing so well, so I can be available for adoption. I will be a big girl. I am very sweet and love to play. I still eat 3-4 times a day. I’m not completely house broken yet but I am good if you could take me outside every 1-2 hour. I always copy my big foster brother and sisters so I pee and poop outside just like them. I sleep in my crate and won’t cry until you wake up in morning. My foster mom always say I’m a good girl. I need someone who can pay a lot of attention to me! Django is still 9 weeks old (as 03/12/2018) and not ready for the adoption yet. He came to our rescue as owner surrender. He is very active and needs a lot of exercise. He has a Mal personality in Shepherd size. 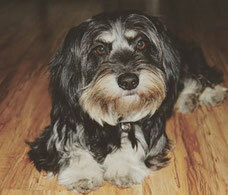 He is required to be adopted by the breed experienced owner who understands this breed and provide a proper training. 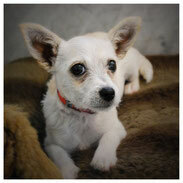 Paloma was rescued from a junk yard in Colton. She is about 7-8 months old. Still has a good puppy energy. She gets along with other dogs very well. She is VERY sweet and loves people. She is appx 40 lbs. We believe she is still growing. We guess she is Husky/Jindo mix. 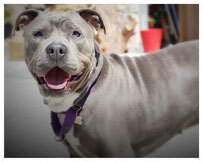 Olive is appx 5 years old beautiful Staffordshire Terrier who was recently rescued from a local high kill shelter. She gets along with all dogs she has met... and great with people. She has a very sweet personality and loves to cuddle. She had entropion and we recently provided surgery. Her eyes are completely healed and look clear. She is about 65 lbs, low rider, spayed, received UTD shots and microchipped. 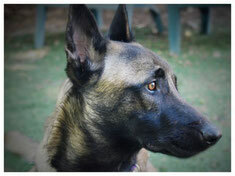 She is currently at her foster home with other dogs (large and small) and child. 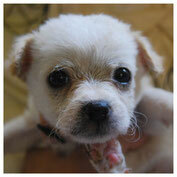 Solin was rescued from a junk yard in Colton. He was abused by people who worked there. He is still sweet and loves people. He gets a little shy in the beginning but warms up quickly. He is GREAT with other dogs. He is about 4-5 months old, already neutered and received UTD shots. He is microchipped as well. He is currently about 25 lbs but we believe he will be a medium to large size. His paws are big. We are not sure his breed... 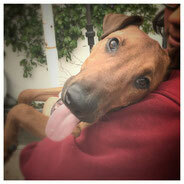 He has paws like a Doberman... but looks Ridgeback..
Chibi was rescued from hoarding case with his siblings. 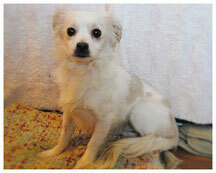 He is very shy in the beginning but he is actually a very sweet, affectionate and playful once he warms up. 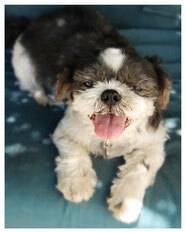 He is about 10 lbs, quiet, good with other dogs in any size, may chase a cat but no aggression. He received UTD shots, microchipped and neutered. He has a very soft fur with a beautiful long tail.